At the age of 12, she featured on the front page of the prestigious London Times. At the age of 13, she was conferred with the National Youth Award by the then President of India. At the age of 16, she was awarded the title of ‘Dolphin Queen’ by the Government of New Zealand. Meet Rupali Repale, India’s open water long distance swimmer, who at the age of 12 became the youngest, Indian, to successfully swim the English Channel in August 1994. Repale then went on to conquer seven straits and break several records in her illustrious swimming career. Lean and petite, she greets us with an unassuming smile as we meet at Palava’s golf club to hear of her adventures that began in the pool and crossed several seas and oceans. ‘My father enrolled me for swimming as he believed some exercise is essential, I was only three years old then and had little choice,” says Rupali, who for a year and a half thereafter tried to hide in the ladies’ locker rooms to avoid coaching. Encouraged by friends, she slowly befriended the pool and just like school, coaching became a routine. An average swimmer known for good stamina, she graduated to the competitive batch at the age of 6 and had her first tryst with long distance swimming when she became the youngest swimmer to successfully swim from Alibaug to Mumbai’s Gateway of India in November 1993. “My coach was reluctant to allow me to participate as I was underage, yet my father persisted and gave parental consent,” she reminisces. Little did she know back then that with that consent her journey with the deep blue had just begun! 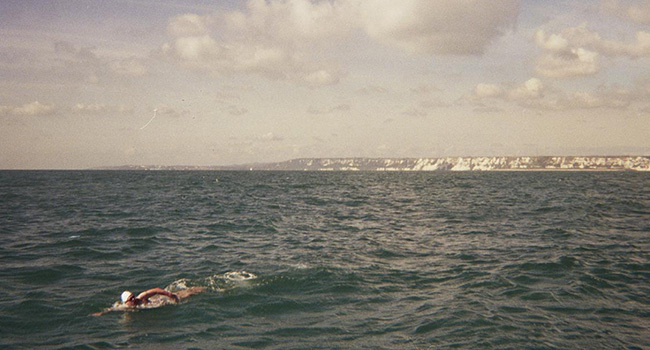 “A family friend mentioned to my father about the English Channel and suggested that I participate in it as I was good with long distance swimming,” she says, when asked on how she decided to swim the English Channel. “My family comes from a very modest background and no one had heard of the English Channel and the training needed for it or perils associated with it. My father said no harm in trying and went ahead and applied,” adds Rupali. The application was delivered to a wrong address and she didn’t hear from the committee until late June 1994. While the family assumed it was rejected, the committee wrote back stating that she could swim that August, not knowing that Rupali’s father has stated her weight as 38 kilos while she weighed only 28 kilos as of June that year. “Back then to participate in the English Channel the minimum required age was 12 years and weight was 38 kilos,” she says, “I had one month to put on 10 kilos. My doctor put me on a high fat diet with eggs, milk and meat and barred me from swimming more than once a week.” While Rupali focused on her weight gain, family and friends came together to raise funds for the expedition. “My school friends contributed with their pocket money,” she remembers fondly. On board to London in July 1994, Rupali weighed an exact 38 kilos and the rest as we know is history. On 15th of August, 1994, after continuously swimming a distance of 34 kms from England to France, in 16 hours and 7 minutes, she became the youngest swimmer for that year, and second youngest ever, to successfully swim the English Channel. She missed being the youngest swimmer ever to achieve this feat by just a day. Overnight, Rupali Repale became the talk of the town. She was felicitated mid-air by the crew while returning home, awarded several accolades by the Indian government, and had sponsors queuing up to associate with her challenges. Amidst all this fury of attention, she remembers her father having a candid chat with her, “He asked me if I enjoyed swimming and wanted to pursue it further. He assured me that there was no compulsion to do so,” she remembers. Spending her childhood shuttling between school and the pool, Rupali didn’t know much beyond her friends and swimming and naively decided to pursue it further. Did she ever dream of scaling such great heights and achieving fame? “My father and my family didn’t know what one could achieve in this sport so we had no expectations. We simply kept taking a step at a time,” she says. As well said by someone, ignorance is bliss indeed. Rupali went on to successfully swim across the Gibraltar Strait, Bass Strait, Cook Strait, Palk Strait and others until 2000 and often was the first woman to achieve such feats. And with each swim came a new challenge and adventure. “While swimming across the Palk Strait at midnight, I lost my way and found myself stranded near a lighthouse surrounded by fish,” she narrates with gooseflesh, “Being a LTTE endangered zone, I was found by a Navy ship after 30 minutes.” During her swim from Gateway of India to Alibaug and back she had her stomach bitten by a poisonous fish! On completion of the shark infested Bass Strait she had lost her toe-nails. The body ached many times, but her mind did not quiver and she successfully completed each challenge. While signing off she advises, “Remember, only you can guarantee your success.” Like father, like daughter one would say. A little-known fact is that post her swim, the English Channel revised the minimum age required for the challenge to 16 years and it continues to stand till date.